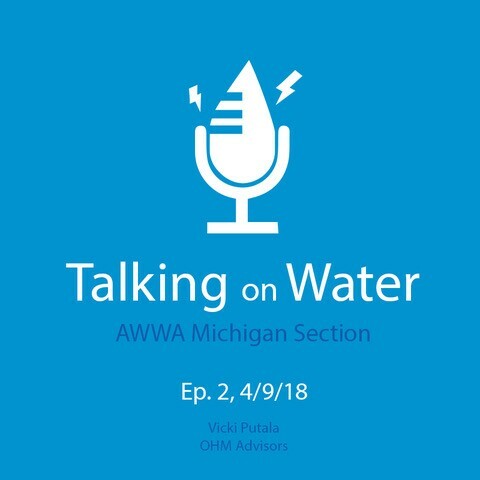 Announcer:	Welcome to the Talking on Water podcast, a service provided by the Michigan section of the American Water Works Association. This podcast offers insights and useful career information for Michigan water professionals. Now, here's your host, Pat Staskiewicz. Pat:	In this second episode of Talking on Water, we welcome Vicki Putala from OHM. Vicki shares her experience as a woman in the water industry and shares her perspective on moving from the UP to City of Detroit. I'm here today with Vicki Putala. Vicki is a director of environmental resources OHM out of out of Livonia. Can you tell me a little bit about yourself and how you ended up at OHM? Vicki:	I grew up in a small town in the Upper Peninsula, a little town called Lake Linden north of Michigan Tech. And I grew up along the shores of Lake Superior, which is the most beautiful clean water that you can ever see. And I've always had a passion for water. When I went to college, I didn't know what I wanted to get into at first, but then I saw that Michigan Tech had a degree program in environmental engineering and I thought “Thank God. I can do something with water.” And so, I got my degree and I started working on doing wastewater treatment and drinking water treatment. And I absolutely loved it. After about 4 years of doing that for a consulting company in the Upper Peninsula, my husband got a job downstate. So, I moved to the Milford area and I got a call right when I was thinking about going back to work and took a job at OHM Advisors as a hydraulic engineer. And I have been there ever since. It's almost 25 years this year. Pat:	This water industry is made up predominantly of white males. Can you can you explain to me a little bit some of the challenges you had even from college and getting right into the industry and how it's evolved now? Vicki:	My very first day at a company up in the Upper Peninsula, I’ll never forget it. I was in a suit. I was excited. I was starting my engineering career. And I'm walking through and a client was in the front reception area and he said, “Oh, Miss, could you get me a cup of coffee?” And I'm like “Well, I don't know where the coffee is. I just started working here, but, okay, I was raised to be nice and polite.” And so, I dutifully went to look and get a cup of coffee, but then it dawned on me that he assumed I was a secretary and not an engineer working there. What I have learned to realize is that even though people don't mean it, there are unconscious gender biases that women face in this profession because people generally relate and feel comfortable around people that are more like themselves. And so, men approach issues differently than women approach issues. And so, as I have worked in my career, I've educated myself on this and it has really helped me communicate better with some of the peers in my industry. And on a side note, a couple years ago, I started a women leadership and career development before I’m at OHM Advisors to help other women understand some of the challenges that they might face in a male dominated industry and just really opening your eyes to the challenges and making people aware of unconscious gender bias has really made a difference. Pat:	Can you tell me a little bit more about this work group that you’re with? Vicki:	A couple other women at OHM Advisors and I have created a— Oh, it's about twice a year. We host these forums and we tackle issues that we have seen as barriers in our career as we've advanced and moved up in our different organizations. And we bring in guest speakers to help other women see what challenges they have come against and also where are they finding advocates, where are they finding helpers in their career. And we do some role-playing on how to deal with some of the sensitive issues that you hear the news now about sexual harassment and how do you handle that because when you're a 22 year old and you're in a male dominated field, sometimes you have to know how to address situations. So, we try to prepare our women with information and provide a safe place for them to ask questions because sometimes our young women aren’t comfortable going to their male supervisor and raising these issues. So, it's a supportive safe environment. Pat:	So, at OHM, how many women do you think are employed there roughly as far as the percentage and has that changed throughout your career? Vicki:	So, at OHM, we have about 430 employees. When I started in 1993, we had 90. So, I've seen the company grow. I think overall the firm has about 30% women. But my team that I lead, I lead the environmental water resources department, I have about 40 team members and happy to say more than half are women. And I think more women are coming into the field. [0:05:01] But what I have seen over my career is that women have a tendency to leave the field. And so, I've been focusing much with my women's leadership group on why do women not stay in the field. What are the barriers that they're coming into contact with that prevents them from being able to move up into their career? Usually, women will stay for the first 4-5 years. That's usually when they start having families. And so, what we do is we create a support bridge to help our women keep their foot in the door so when they are ready to come back they haven't lost ground. It’s not difficult to get back into the swing of things. And so, my team, I think we've really practiced that and we’ve really have been a role model for other departments at OHM advisors on how you can successfully do that. And I'm really proud of the women in my team and what they've been able to accomplish. And I think one thing that maybe I do differently than some of my male counterparts is when I hire people, I don't really care what experience they have. I look for people with passion. And when you have passion, you can do anything. You can learn anything. You can accomplish anything. And when you hire people with passion, even if they go part time or they work less hours, they give you 150%. And so, it all is about hiring the right people. You need to have people that also relate well to your mission because you have to have passion and you have to be aligned in your mission of what you want to accomplish. And when you get the right people, it doesn't matter how many hours they put in. They're engaged and they accomplish great things. Pat:	Tell us a little bit more about what that means to be providing public health to other people. Vicki:	I think maybe I'll answer that question by one of my favorite projects. When I first came to OHM, it was a long time ago. It's kind of funny that that's one of my favorite projects. There was a community, New Hudson by Lyon Township, that the residents’ individual wells are contaminated by trichloroethylene. And I worked with the Michigan Department of Environmental Quality to get a new water source and get these people off bottled water. To this day, that was more than 20 years ago, that's the highlight of my career. I was able to bring clean drinking water to people who were truly suffering. And we think about third world countries that don’t have safe drinking water, but we have that also here in our own country. And so, that was really meaningful and it's something that I will always look back on my career and think “Yeah, I was able to help those people.” And it's a good feeling when you can do that. Pat:	So, is that a project that you've drawn upon when you've had some challenging projects and needed to dig deeper? Vicki:	That was an interesting project in that that client leader fired me, which is kind of interesting because I don't really understand politics very well. And I stood up at a board meeting, spoke the truth. I was taught to speak the truth. And sometimes politicians don't wanna hear the truth. So, I draw on that project for multiple reasons. One is I used my skills and talents to do good and help people. I think that's why we're all in the water profession. We all wanna help people. But I also draw on sometimes you learn the most from things that aren’t pleasant in your life. I draw on that that no matter what, you should always do what you think is right and always, always be honest and speak the truth regardless of the consequences. And I have used that as a life lesson because there's a lot of pressures on people, but you do need to stand firm and do what you think is always correct. Pat:	Can you explain some of the challenges around work? I’m thinking we've got a new engineer, a female engineer in my office and just even where to sit at the lunch room is all of a sudden now something we're all thinking about. How have you had dealt with that at OHM? Vicki:	Well, we onboard a lot of new employees all the time and I don't really separate men from women. I treat everybody the same. I would just encourage that you just— Everyone's the same. When you start separating people too much, you're making that hypersensitive that there are these differences, but I think you should also be very clear on what is acceptable behavior and what is not acceptable behavior. And as a manager or a supervisor or in my case I'm an owner at OHM Advisors, I have a responsibility to be clear on what is acceptable behavior and not and to communicate that and make sure people are aware of that. And so, we always practice that you work in a safe work environment free of harassment, bullying, intimidation. We have a core value of team work. I expect my team members to support each other, and to help each other, and to be there. And I don't tolerate any type of harassment of any kind. I think it's really important that the leaders speak up and make sure that that is awfully where— If you set those ground rules and your team members know that, then you don't have to treat people any differently. You can treat them all the same. Pat:	Talk a little bit about the diversity and your leadership and how that diversity helps your company to become successful? Vicki:	Diversity is really important and this is one of the lessons I learned in the early 2000s. Shockingly, we’re not all right all the time. We have our strengths. We have our weaknesses. And I went through a leadership development course where I learned to recognize my blind spots. And I learned how to surround myself with people who have strengths in areas that I am weak. And when you have people with different strengths, they’re usually not the same type of person as you and so you have to make a conscious decision to bring people on your team that aren't like you and that's hard for us and some people never get that. But when you make a conscious decision to say I value this person because they're not like me and you bring that diversity, then you have strengths in all areas. You don't have blind spots. And I talk in analogies all the time. It drives people crazy. But I always say that we are all different shaped puzzle pieces. We have a very flat organization. No one is more important than anybody else. We’re all shaped differently. We all have different strengths. But when we come together, we build something awesome. That I think is what diversity means. We value everybody's different shapes, strengths. And we just learn how do we collaborate and pull all that together. Pat:	Talk a little bit about some of the strengths that women bring to the table. In Washington, there are more and more leaders being elected and that's changing the dynamic. Vicki:	I think some of the strengths that women bring are more collaborative communication. It's interesting when you go to school and you learn all this technical information, it’s not what you need to be successful in your work or in your career. It’s communication. And women have more of a natural talent at how to build consensus, collaborate. They have I’ll say more emotional intelligence on how to read situations. They can put themselves in other people's shoes and I kind of sense they use more intuition on how to handle a certain situation. We're not necessarily out front being that strong leader and this is where I think we need to just appreciate the different styles. Sometimes you need that strong decisive leader. Sometimes you need more of a collaborative approach. And so, diversity in leadership is another way that we all can go forward. Pat:	Are there any challenges in particular in the water industry for women? Vicki:	I would say that I'm not that gray haired old guy that when I go to a waste water treatment plant the operator usually looks at me and says you don't know you're talking about. So yes, there are some challenges, but I have learned to bring that gray haired old guy with me. So, you learn how to work around things. It’s not really any different than any other industry. Everybody in the water industry wants to make sure everyone has clean water, that the rivers and lakes are clean. We all have the same goals. As long as you are aware that we're all trying to get to the same point, we might just have different ways of getting there, and you appreciate those different styles, I really haven't had too many challenges except, like I said, I sometimes don't look the part. Pat:	Talk a little bit about your small town upbringing and how that impacted how you navigate Milford and the big city of Detroit. Vicki:	So, my small town upbringing and I am a little embarrassed to say that I really never left the UP until I was in high school and there aren't really that many one-way streets and there is certainly no traffic lights. I moved to Milford because it reminded me of Houghton, Michigan. I was scared to death to go towards the city. And in fact, if OHM had been 2 miles further east, I never would have went to work there. It was too close to the urban center. And my husband always laughed at me because I refused to get on the expressways for a full year because I didn't know how to get off and how on earth do I get back on. When I think back, it's silly, but it was pretty terrifying for me to come down here because the cars are going so superfast. And I was just not used to all of that traffic. But I've been in Milford since 1992 now and I absolutely love my town. And yes, I actually do go to urban centers and I've learned how to adapt. Pat:	A young woman entering the water industry may feel like they're jumping on that highway at 70 miles an hour. What would you recommend to them as a way to have a safe on ram into this industry? Vicki:	You know, I'm going to answer that with the advice that I give all the young women that come into my team. It’s something that I did not do and I wish I would have done it, is to join professional organizations and network with people your own age, get to know people, build your relationships, get some friends in the industry because your friends are gonna help you. And when you are an introverted engineer as I have been in my entire life, getting involved in an organization is scary. It's scary that you meet people you don't now. So, I always encourage young women to get out there, talk to people, and make friends because they're gonna be there for you when you need help. Pat:	So, I'm looking back at the section I've known for 25 years and it's nice to see more and more women involved. We've had our share of leaders. And once again, we have a woman later. So, can you speak a little bit about that and your experience with the section? Vicki:	So, as I said, I didn't get involved early on in my career and I certainly do belong to AWWA. And I’ve had the opportunity to be a presenter at a number of different conferences. I've also participated in the women's networking sessions and I think really what I love about the section is that it really brings men and women together and just helps align everybody around making sure that we have clean drinking water for everyone, that the technical programs are awesome. When you're young, that's what I think you need to learn. As you advance in your career, it's really understanding how do you work with each other to solve these bigger regional and maybe even global problems. Right now, I tell my team we have to dream about the future. We have to dream about what do people need, how do we address emerging problems. And when you are associated with all these professionals, you can draw upon all this knowledge on how to solve problems. Sure, we compete with other consultants. But at the end, we all have the same goal, is to ensure that we all have safe clean drinking water. And so, the section provides a great place where people from different walks of life whether they're utilities, or consulting firms, or regulatory agencies can come together and share knowledge. And I think that that's just really important and that's a great service that the section provides. Pat:	You mention that women in water, that was the board’s attempt to provide a safe place for women to network and grow. It seems like that has grown over the years and you were involved with that. Can you speak to that a little bit? Vicki:	I was just at the event last fall and I thought it was a wonderful networking opportunity. And we talked a lot about just how women speak versus how men speak. And it's just more that education. But to springboard from that here in Michigan, one of my team members is starting a women networking in Ohio. A very similar program. They don't have anything like that. But just having the Michigan section have a venue like that, now we’re able to create that in another state, which I just think is just awesome to be able to do something like that. I would just add that when women are looking to move in their career, they don't have to look and see the person above them. They can create their own path. So, for me, at OHM Advisors, two other women engineers and myself created the Environment and Water Resources Department because we wanted to play with water all day long and you can create your own path. Pat:	Can you give us your contact information please? Vicki:	Absolutely. So, my e-mail is Vicki.putala@ohm-advisors .com. And my phone number is (734) 466-4479. Pat:	Thank you very much. Announcer:	Thank you for listening to this episode of Talking on Water by the Michigan section of the American Water Works Association. Please contact us at (517) 292-2912 or feedback at mi-water.org with any comments or ideas on future shows. We'd love to hear from you.